Right now we are waiting for new Louise YOUNG Still life Art to arrive at the gallery. In the meantime, here is a wider selection of the artist's work featured at the Red Rag British Gallery. Louise Young was born in Galloway, Scotland in 1956 and enjoyed the outstanding natural beauty of its countryside and its coast till her early teens. She was well-known for collecting wild flowers, shells and pebbles. At eighteen, she moved to Wales and studied Fine Art at Cardiff College of Art. Later, her love of gardening and natural history led Louise to study a Diploma in Botanical Painting at the Chelsea Physic Garden in London in 2004. 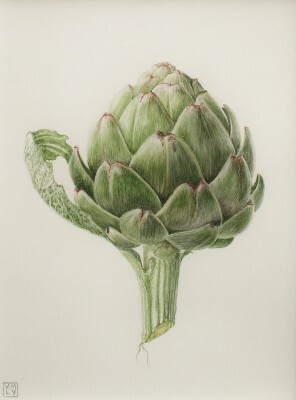 Louise uses highly traditional techniques including watercolour on vellum to produce paintings of natural and botanical subjects in a contemporary style. Louise Young has work in private collections in the UK and the USA and in the permanent collection of Welsh contemporary art at MOMA Wales, Machynlleth. Louise is a founder member of the group Amicus Botanicus.